The decorative glass media is used to complete the contemporary look of the burner used in this fireplace and covers the burner ports for proper operation. Below is a list of chimney components that are compatible with this item. If you are comfortable picking the components that you need for venting this item, please choose from the items below. If you need any help at all, please use our FREE advice from our certified fireplace specialists. Are you looking for an efficient and economical vent for your fireplace that won't compromise the style of your current decor? This 6-inch Rigid DV model from Empire may be the perfect option for you. An inner wall made from aluminized steel guarantees top of the line performance, while the galvanized steel outer wall further contributes to this piece's incredible efficiency. Its design places a high priority on safety, featuring secure twist lock connections as well as a floating inner pipe, and its manageable size (4-1/2 inches by 7-1/2 inches) ensures that this vent will fit nicely anywhere you need it. Once you've purchased a gas log fireplace, you'll want to make sure you have the correct accessories to insure a properly working system. The SecureVent 12-inch Rigid DV Vent SV4-5L12 is constructed with a strong aluminized inner wall and galvanized steel outer wall that keep it from losing shape under pressure and rigidly support the vent system. The inner pipe is designed to float for added safety. The secure lock twist connections create an airtight seal that is three times tighter than the industry standard. This 12-inch long vent has a 7-1/2 inch outer diameter and 4-1/2 inch inner diameter. To prevent deformation under pressure, the SecureVent 24 Inch Rigid DV Vent SV4-5L24 has a galvanized steel outer wall and an aluminized inner wall. The durable construction provides solid support and safety for the entire system. Safety measures include floating inner pipe and secure lock twist connections that make the seal airtight without the need for gaskets or silicone. The inner wall has a 4-1/2 inch diameter and the outer wall has a 7-1/2 inch diameter. Install this 24-inch vent accessory with your Superior gas log fireplace and get a limited lifetime warranty. Then relax, knowing you have a reliable system in place. A fireplace that is not correctly vented creates a big problem for the homeowner. 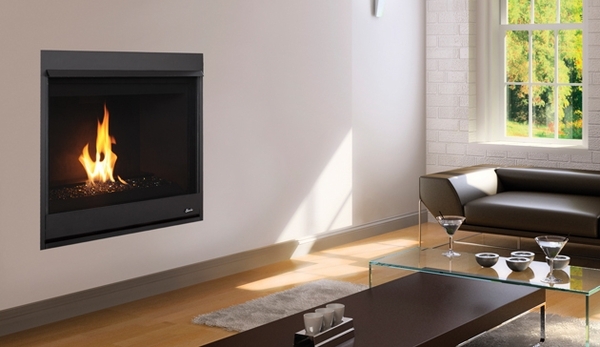 Ensure a problem-free system by installing the right accessories for your gas fireplace. The SecureVent 36-inch Rigid DV Vent SV4-5L36 is well made and constructed with the latest technology. Designed to surpass industry standards, the 36-inch vent is made with a galvanized steel outer wall and floating, aluminized inner wall. The outer wall's diameter is 7-1/2 inches and its inner wall's diameter is 4-1/2 inches. The pipe is constructed with secure lock twist connections that create a seal that is airtight. Includes a limited lifetime warranty. If you want a reliable fireplace system, make sure it is vented properly to reduce the risk of damage from fire, heat, and smoke. Install the SecureVent 48 Inch Rigid DV Vent SV4-5L48 for enduring quality that does the job. This vent is built of durable galvanized steel on the outside with an aluminized inner wall, and it has a floating inner pipe for additional safety. It is also designed to have a tight seal with its secure twist lock connection. The 48 inch pipe has an inner diameter of 4 1/2 inches and an outer diameter of 7 1/2 inches. Includes a limited lifetime warranty. If you have purchased one of our outstanding fireplace log sets and would like to extend the existing vent run, this SecureVent rigid adjustable slip section is the right choice to get the job done. Measuring 4-1/2 inches in inner diameter and 7-1/2 inches in outer diameter, this slip section will give you between 2 to 7-1/2 inches in additional vent run space, greatly enhancing your log set's fumigation. There is no need to be concerned about this slip detracting from the overall appearance of your log set; its construction is both durable and stylish. The piece also comes standard with a limited lifetime warranty. When you're creating a customized chimney for your home, you'll need a variety of parts to ensure that the smoke makes its way outside. This SecureVent 45 Degree Elbow - SV4-5E45 - is the perfect option for making your way around 45-degree curves. It can be swiveled at the base to accommodate many different curves. The part has an aluminized inner wall and a galvanized steel outer wall. Its secure twist lock technology makes it easy to connect to other pieces in the SecureVent series. This elbow is specifically designed to be used with other SecureVent 4-1/2 inch by 7-1/2 inch direct vent parts - parts that have a 4-1/2 inch inner diameter and a 7-1/2 inch outer diameter. SecureVent offers a limited lifetime warranty. As you create a chimney, you're going to encounter a variety of twists and turns. This SecureVent 90 Degree Elbow - SV4-5E90 - is designed to make its way around some of those sharp curves. It can be swiveled at the base to accommodate a variety of different angles and allows an offset of the pipes, which helps to avoid obstructions. This elbow offers a 4-1/2 inch aluminized inner diameter and an outer diameter of 7-1/2 inches created from galvanized steel. It is designed for use with other SecureVent 4-1/2 inch by 7-1/2 inch parts. The distance from the base of the elbow to the center line measures 8-1/2 inches. The total height is 12 inches. SecureVent offers a limited lifetime warranty on this part. This SecureVent Roof Flashing - SV4-5F - is designed to be used with a flat roof. It is constructed with galvanized steel for incredible strength and durability in the midst of various weather conditions. The sealed seams ensure leak-proof installation, so you can be sure that no water will get into your home on rainy days. At the base, it measures 20 inches by 20 inches. This SecureVent Roof Flashing is designed for use with SecureVent 4-1/2 inch by 7-1/2 inch direct vent systems. This SecureVent Roof Flashing includes a limited lifetime warranty to ensure that it continues to offer excellent performance over time. Find high quality roof flashing for your 1/12 to 7/12 pitch roof with this SecureVent Roof Flashing - SV4-5FA. This product is constructed with strong and durable galvanized steel designed to withstand various weather conditions. The sealed seams in this roof flashing will prevent leaks even on the stormiest of days! At its base, this SecureVent roof flashing measures 24 inches by 24 inches. It is designed for a roof that has a pitch between 1/12 and 7/12. SecureVent's limited lifetime warranty for this product ensures that you are satisfied with your purchase and that it continues to meet your expectations. Find high quality roof flashing for your 7/12 to 12/12 pitch roof with this SecureVent Roof Flashing - SV4-5FB. This product is constructed with strong and durable galvanized steel designed to withstand various weather conditions. The sealed seams in this roof flashing will prevent leaks even on the stormiest of days! At its base, this SecureVent roof flashing measures 24 inches by 24 inches. It is designed for a roof that has a pitch between 7/12 and 12/12. SecureVent's limited lifetime warranty for this product ensures that you are satisfied with your purchase and that it continues to meet your expectations. If you have a fireplace in your home, you understand the importance of using storm collars to keep precipitation out of your chimney system and to avoid potential water damage from leaks. This storm collar from SecureVent is made for maximum protection and durability, boasting a galvanized steel construction and exceptionally secure bolt connections to minimize the risk of water seeping between the pipe and the flashing. The entire system measures 10-1/2 inches at the base of the skirt, with a 2-3/4 inch width. If you purchase this storm collar, you also receive the confidence that comes with a limited lifetime warranty. When you are looking for a durable and secure chimney, the SecureVent Rigid Horizontal Spacer - SV4-5HF5 - will help you get the job done right the first time. This horizontal spacer is used to maintain the proper clearance when passing a pipe through a combustible wall. It has been designed with galvanized steel construction for maximum durability. This part is intended for use with SecureVent pipes with an inner diameter measurement of 4-1/2 inches and an outer diameter measurement of 7-1/2 inches. The spacer itself measures 16 inches wide and 20 inches tall. SecureVent offers a limited lifetime warranty on this product. The SecureVent Rigid Horizontal Firestops - SV4-5HF-10 - offer a quality firestop constructed with galvanized steel. These high quality firestops reliably maintain the proper clearance when passing pipe through a combustible wall. These firestops are designed to be used with SecureVent pipes which measure 4-1/2 inches in the inner diameter and 7-1/2 inches in the outer diameter. They measure 16 inches wide and 20 inches tall. SecureVent's limited lifetime warranty ensures your continued satisfaction with your purchase. Installing a heating appliance in your home or commercial building requires quality components that have been specifically manufactured to withstand heat and fire and to provide a high level of protection. This Rigid Vertical Firestop made of galvanized steel properly seals the openings through the ceiling to prevent smoke and toxic gases from seeping into your business building or place of residence. Measuring 16-inches square, it provides superior support for long pipe lengths, is UL and ULC listed, and comes with a limited lifetime warranty. Security Chimneys products are dedicated to quality and consistently maintain the high standards you expect in manufacturing. This support plate is an absolute must if you have purchased a Superior 4-1/2 inch by 7-1/2 inch direct vent system. Designed specifically for that system, this 16-inch by 16-inch plate (SecureVent's SV4-5SP model) is at its best when utilized on a ceiling or even within the chimney closure itself, providing reliable support for your vent system. The product's designers incorporated an exceptionally strong 1-1/2 inch wide bolted clamp to maximize its vertical support. As with any Superior product, you can be confident that when you install this support plate, you are getting an extraordinarily durable and high quality product. Have you purchased a 4-1/2 inch by 7-/12 inch direct vent system from Superior? If you have, your next step should be to install the SV4-5SU support strap. This strap has been designed specifically for additional structural support at offsets and during horizontal runs for your particular vent system. This guarantees that the two pieces will fit and work together in the most efficient manner possible. The SV4-5SU support strap measures 23-1/2 inches long. Its galvanized steel construction also makes it incredibly durable, which ensures that you get a long lasting solution to any horizontal support concerns in your chimney. Properly installing direct vent appliances is crucial for safety and protection from high heat and possible fire damage. A Through Wall Shield provides another layer of protection and provides the correct clearance for the pipe to be properly fitted through a combustible wall. Installing the wall shield on both sides of the wall is not only necessary for safety but keeps cold air infiltration at a minimum. Through Wall Shields are crafted of galvanized steel, are very durable, and have tabs that create a secure grip. This SecureVent product by Security Chimneys is a trusted brand in North America and complies with UL and ULC standards. If you own a Superior log set, you know they are extremely efficient and economical. Like all homeowners, however, you are probably constantly searching for ways to keep energy and heating costs down in your home, especially heading into winter. This SecureVent Attic Insulation Radiation Shield can help by increasing efficiency both in heating and cooling your home, as well as protecting you and your family from any potentially harmful emissions. This particular shield has been designed to complement a Superior 4-1/2 inch by 7-1/2 inch direct vent system. If you own such a system, you will not regret adding this shield! When cold weather arrives you want to be prepared and confident that your heating system is in good shape and working well. The SecureVent Horizontal Termination Kit SV4-5HT-2 provides security for gas fireplace owners who trust that their system is reliable and well made. This kit is constructed with heavy-duty galvanized steel and aluminum that withstands pressure and prevents deformation. A built-in standoff protects siding from heat and smoke damage and the included firestop increases the safety of the system. The kit includes a 7-1/4 inch to 10-1/2 inch long adjustable pipe stub and comes with a limited lifetime warranty. Made as an exclusive complement to the Superior SecureVent 4-1/2 inch by 7-1/2 inch direct vent system, this horizontal termination kit is an absolute must if you have such a vent system for your log set. Constructed from galvanized steel and aluminum, this kit offers the very best in durability. The termination features a firestop and comes standard with a 90 degree elbow (SecureVent's SV4-5TK90HT2 model). The secure twist lock connections have been designed to maximize their strength and security as well. As with all Superior SecureVent products, purchase of this termination kit includes a limited lifetime warranty. This SecureVent High Wind Vertical Termination - SV4-5GV-1 - is constructed with durable galvanized steel and aluminum construction. The integral wind guards are designed to prevent stubborn draft issues that occur in areas that experience high winds throughout the year. This SecureVent High Wind Vertical Termination is designed for use with SecureVent pipes with an interior diameter of 4-1/2 inches and an outer diameter of 7-1/2 inches. Its secure twist lock connection provides easy connections, and its solid construction ensures years of service. This part measures 9 inches in height and 12-1/2 inches across. It is covered by SecureVent's limited lifetime warranty. Are you looking forward to long winter evenings by a cozy fire? If so, then properly venting your gas logs will give you peace of mind as you relax in the warmth provided by your fireplace. The 36-inch SecureVent Horizontal Riser Kit SV4-5HRK36 is built with quality and stability in mind. Durable galvanized steel and aluminum construction in this system prevents heat damage and its heavily riveted seams ensure longevity. Measuring 50 inches tall by 22 inches deep by 13-1/2 inches wide, the system includes a 9-1/2 inch pipe stub and secure twist lock connection. Comes with a limited lifetime warranty. The installation of a gas fireplace is a significant investment in any home, and you'll want to ensure that your investment is protected from damage through proper venting. Designed for exclusive use with 4-1/2 inch by 7-1/2 inch SecureVent direct vent systems, you won't have to worry about whether the 14-inch Horizontal Riser Kit SV4-5HRK14 will fit your fireplace. Ideal for basement installations, this system offers homeowners greater flexibility in installing gas logs wherever they choose. Measuring 26 inches tall by 22 inches deep by 13-1/2 inches wide, this system provides proper venting when additional clearance above ground is needed. *Venting Requirements: This unit requires venting pipe with an inner diameter of 4.5 Inches. Please see the Venting Components section on this page for venting pipe that must be used with this unit. It is easy to see that no compromise was made either in quality or design in this series of direct vent fireplaces. Tailoring options are offered for not only the aesthetic elements, such as the reflective crushed glass media, but also for the practical usage features, like the dedicated flue configuration and capability of operation after a power outage. The black painted interior spotlights the flames while the durable textured powder coat finish completes the sleek and unobtrusive look of this model. A conversation piece and a tone-setting component of decor, this system will tastefully enrich your home. Available in 33", 35", 40", and also 45" sizes and adaptable to propane or natural gas systems, these units can shine radiantly in any living space.